We provide a comprehensive range of equipment & services for purchase or rental which custom to project specifications and requirements. Badly corroded and seized nuts can severely delay repair or maintenance operations. We can provide nut splitting services which can quickly remove unwanted nuts ensuring all deadlines are achieved. We provide flange spreader services which consist of a pairs of hydraulic loaded jaws. It can smoothly and evenly spread the stuck flanged joint without the resort of using hammer and chisel. Our hot oil flushing services provide you with hot oil, high velocity, high pressure flushing which dehydrate moisture less than 500ppm and filter residual contaminate as fine as 3µ to 10µ found in hydraulic or lube oil systems according to ISO 4406, NAS 1638 or SAE AS 4059 cleanliness standards. We operate on the principle of turbulent flow (Reynolds No. >4,000), which requires the understanding and skill of a trained technician to ensure that significant damage does not occur to your system during the process and achieving best cleanliness result. Sample of result can be send to 3rd party laboratory test or onsite test using our portable laser particle counter to determine the cleanliness standard. 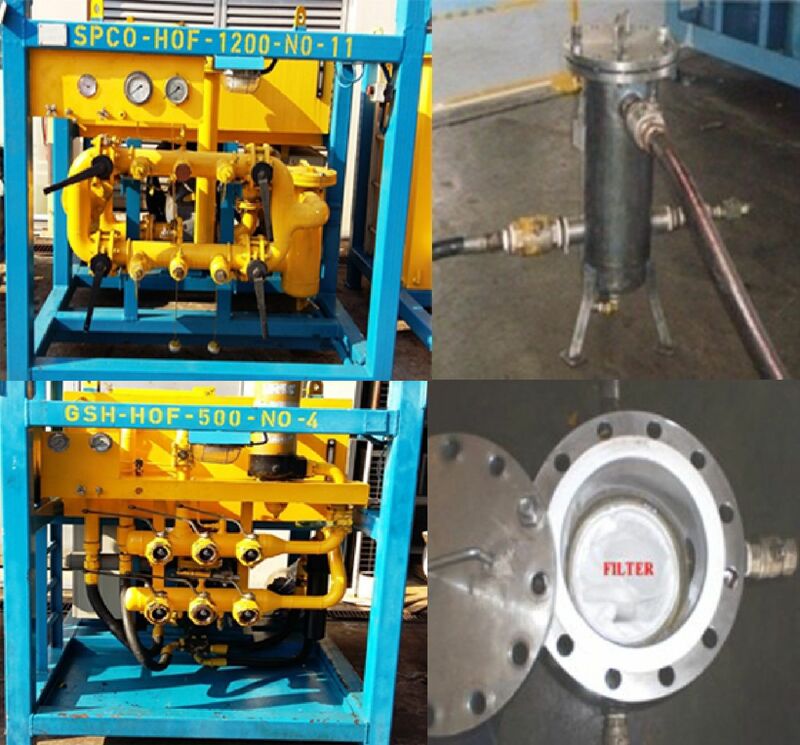 We provide a unique hot oil flushing service, using conventional or specialize design system, developed to increase efficiency and reduce timescales for individual project requirement. 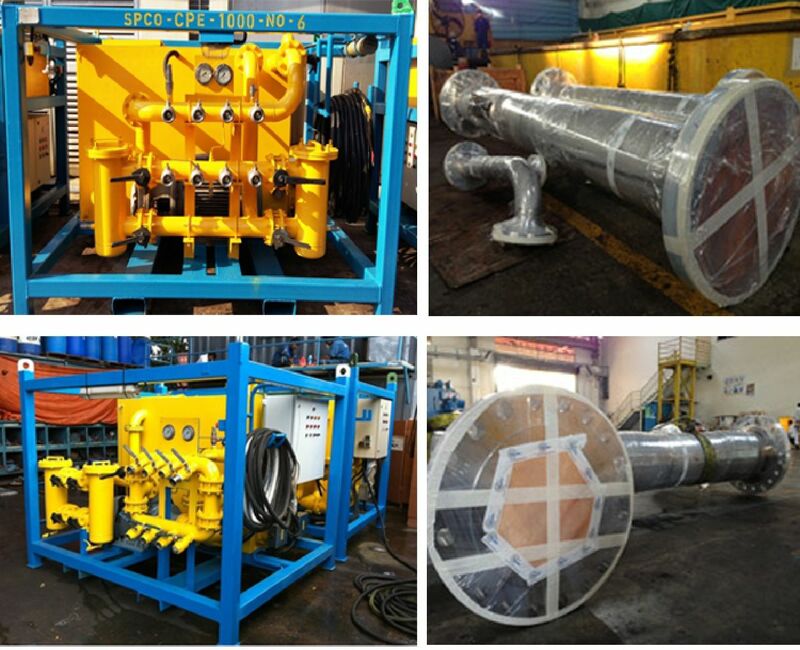 It can be design for onshore or offshore projects for the rapid and effective cleanup of new and in-service turbine, water glycol fluid and hydraulic / lube / thermal oil systems. 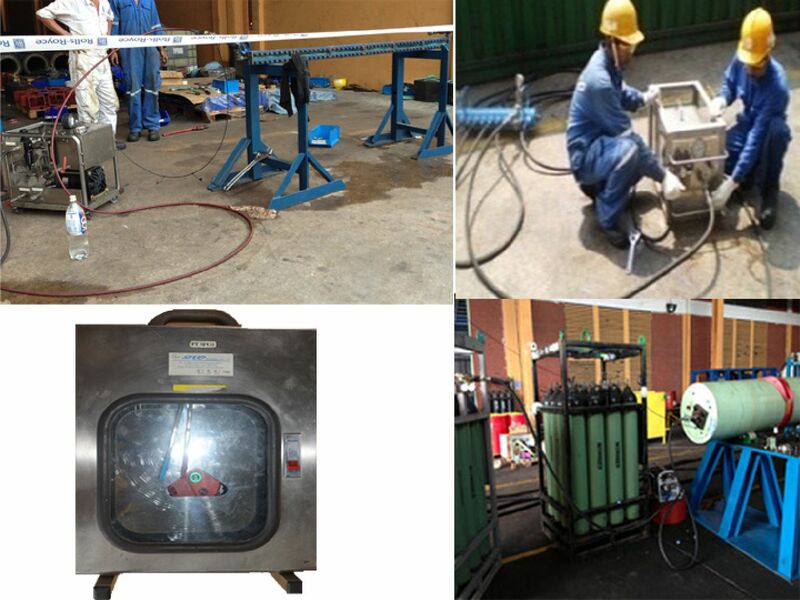 Our equipment can come in compact size, transportable, diesel engine or electrically motor driven and can be configured to work in hazardous areas. We have 2 series of pump depending whether it’s for flooding or flushing of your system. The 1st series is VRG-series pumps which are relatively low in pressure but with a correspondingly larger amount of water flow. It is ideal for consistent running conditions in aggressive surroundings. The pump does not get worn out easily and is guaranteed non-corrosive. They are being used as fuel oil, transfer, bilge, ballast, cooling and stripping pumps. The 2nd series is VRF-series pumps which are meant for fire pump or flushing purposes. 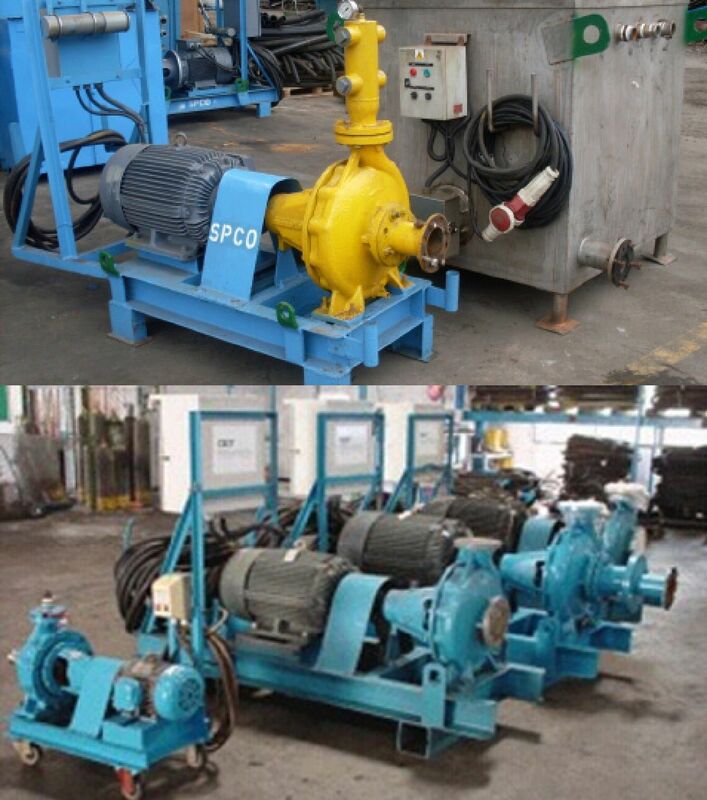 These 2 series of pump is trade mark for both low operating cost and high reliability. We provide desiccant dryer equipment and service to avoid most compressed air problems. 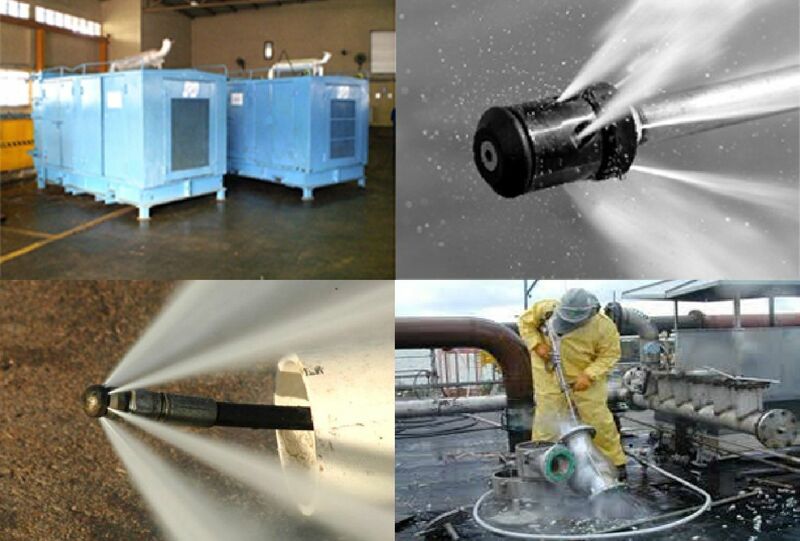 Compressed air contains water, dirt, wear particles, bacteria and oil which when all mix together to form an unwanted abrasive sludge. This sludge, often acidic, rapidly wears tools and pneumatic machinery, blocks valves and orifices. It also corrodes piping systems causing high maintenance and extremely expensive standstill. With the proven benefit of advanced aluminum forming technology, Pneudri comprises of high tensile extruded aluminum columns containing twin chambers each filled with desiccant material which dries the compressed air as it passes through. One chamber is operational (drying), while the opposite chamber is regenerating using either the Pressure Swing Adsorption (PSA) [Heatless] or Thermal Swing Adsorption (TSA) [Heat Regenerative] method of drying. A small volume of the dried compressed air is used to regenerate the saturated desiccant bed by expanding air from the line pressure to atmospheric pressure, removing the water absorbed by the desiccant material, and therefore regenerating the dryer. 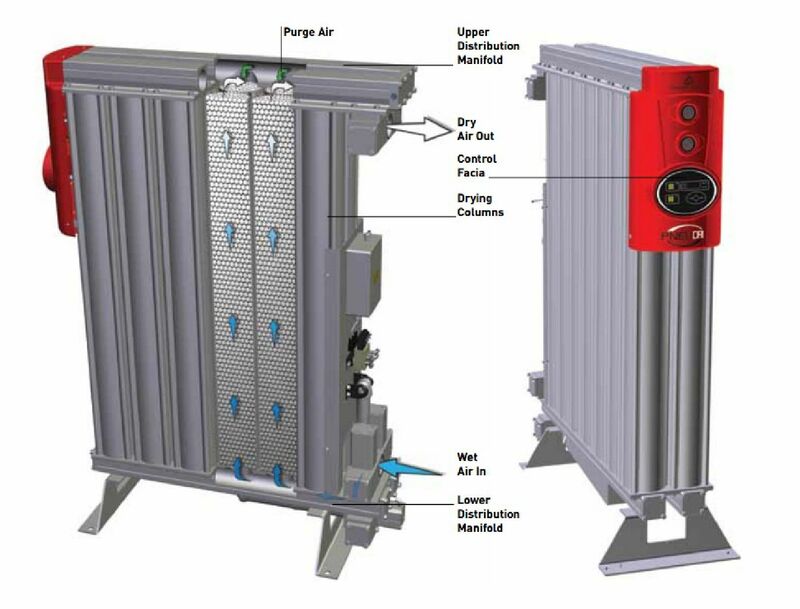 Heat regenerative models have electric heaters built into the desiccant beds to further reduce purge air consumption and increase operating efficiency. Modular design eliminates the need for complex valves and interconnecting pipeline which are used in conventional twin tower designs. The extruded aluminum columns are bolted together in such a way that if your compressed air capacity is increased then additional columns or an additional bank can be added with minimum of disruption. Multitasking of dryers enables individual banks to be easily isolated for routine maintenance work, or even a decrease in air capacity requirements (eg. night shift). This means no interruption to your clean, dry air supply. 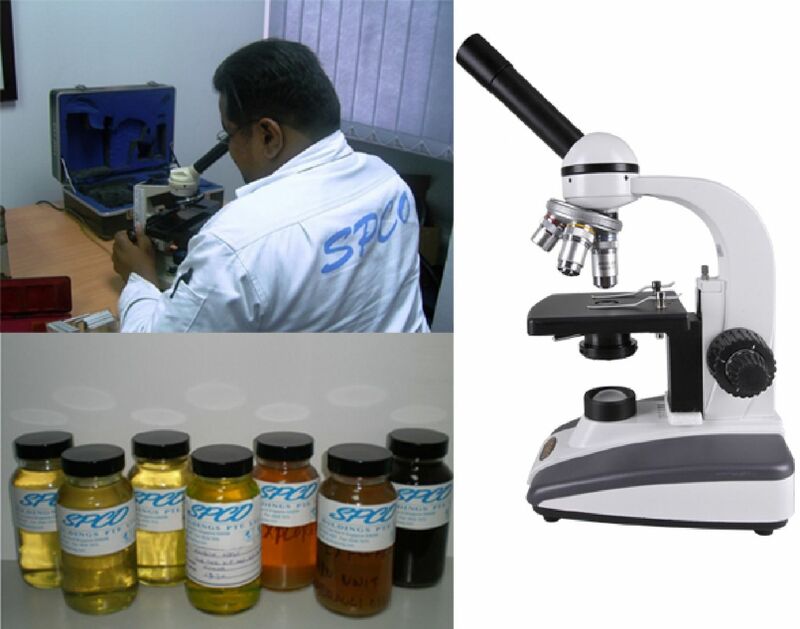 We provide proper oil sampling kit which is critical to an effective oil analysis program. Without a good representative sample, further oil analyses are futile. There are two primary goals in obtaining sample. First goal is to maximize data density. The sample should be taken in a way that ensures there is as much information per milliliter of oil as possible. This information relates to such criteria as cleanliness and dryness of the oil, depletion of additives and the presence of wear particles being generated by the machine. Second goal is to minimize data disturbance. The sample should be extracted so that the concentration of information is uniformed, consistent and representative. It is important to make sure that the sample does not become contaminated during the sampling process. This can distort the data, making it difficult to distinguish what was originally in the oil during the sampling process. To ensure good data density and minimum data disturbance in oil sampling, the collection procedure, device and testing location should be considered. The procedure by which a sample is drawn is critical to the success of an oil analysis. Sampling procedures should be documented and follow strictly by all members of the oil analysis team. The hardware used to extract the sample should be easy to use, clean, rugged and cost effective. In addition, it is important to use the correct type of vacuum clean sampling bottle to assure that extracted sample is not contaminated. Our portable particle counter is designed to serve in aviation predictive-maintenance programs, uses laser beam to calculate the presence of contaminating particles in system fluids. Particles in fluids under inspection are sized and recorded as the fluid flows past and the contaminant particles interrupt the laser beam. The laser light is said to offer advantages compared with white light, including more accurate particles sizing, longer service life and less sensitivity vibration. Early detection of abnormal fluid cleanliness allows for timely investigation and corrective actions to be implemented. 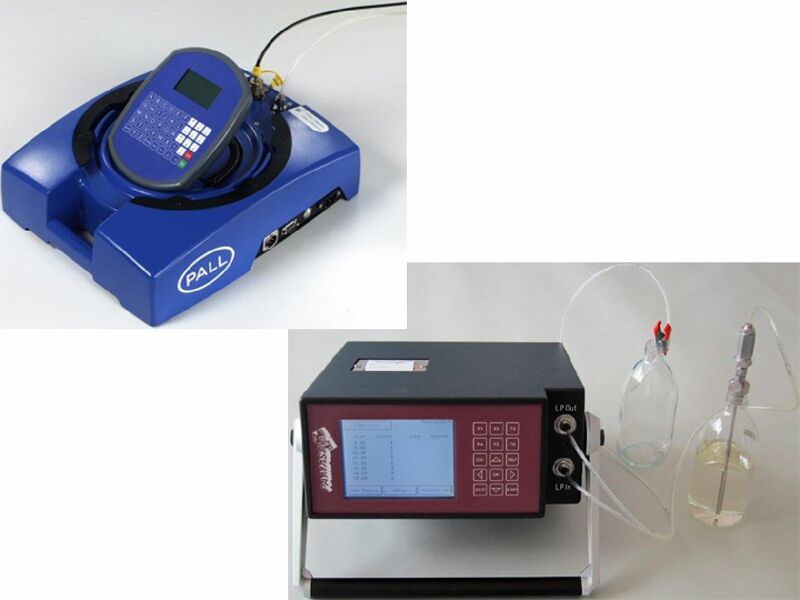 The unit can be used as a portable device for routine condition monitoring of various fluid systems which consist of coolants, water glycol fluid, hydraulic oil, lube oils and fuels. Diaphragm pump is an air-operated positive displacement pump. It displaces fluid from one of its two liquid chambers upon each stroke completion. 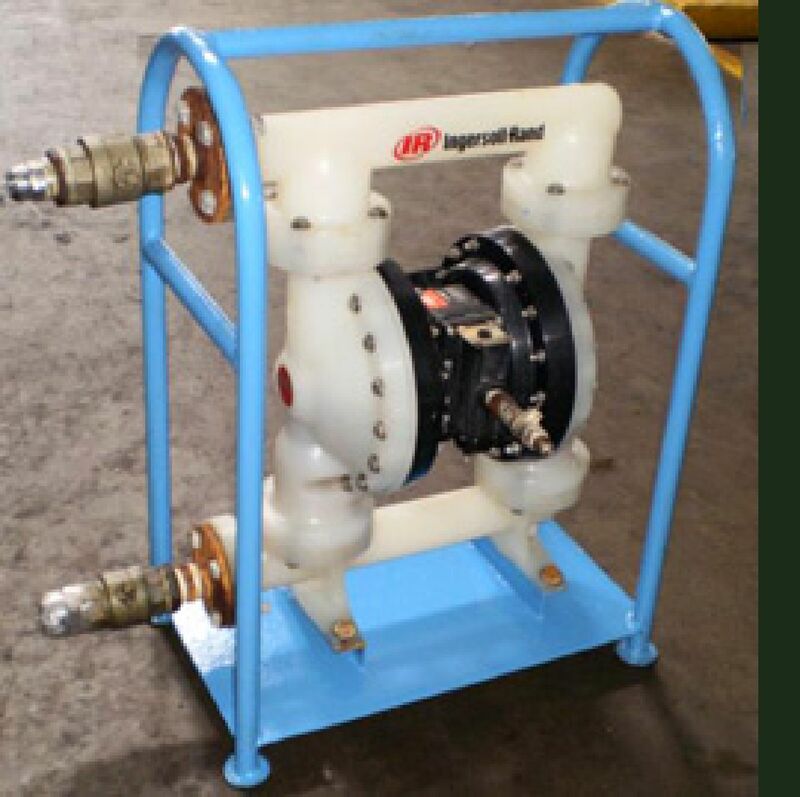 There are a few wetted parts (parts contact with fluid) which are dynamic: The two diaphragms which are connected by a common shaft, the two inlet valve balls and the two discharge valve balls. The diaphragms act as a separation membrane between the compressed air supply and the liquid. Driving the diaphragms with compressed air instead of the shaft balances the load on the diaphragm which removes mechanical stress and therefore extends diaphragm life. The valve balls open and close on the valve seats to direct liquid flow. Our pressure test ensures that the integrity of pipelines or vessels is leakage free and complies with international safety standards or as per defined specifications. The test involves filling the system then pressurized it to a specified pressure and hold for a period of duration depending on its standards or specification. System strength is also tested by measuring permanent deformation through hydrostatic test. Such pressure tests are conducted by our skilled engineers and technicians who are highly trained not just in the practical operation but also the technical theory behind the operation procedure. The combined practical and theoretical understanding coupled with our extensive experience contributes to an effective, efficient and safe process. Our range of non-invasive flow meters utilizes ultrasonic technology for the accurate flow measurement of liquids in full pipes. 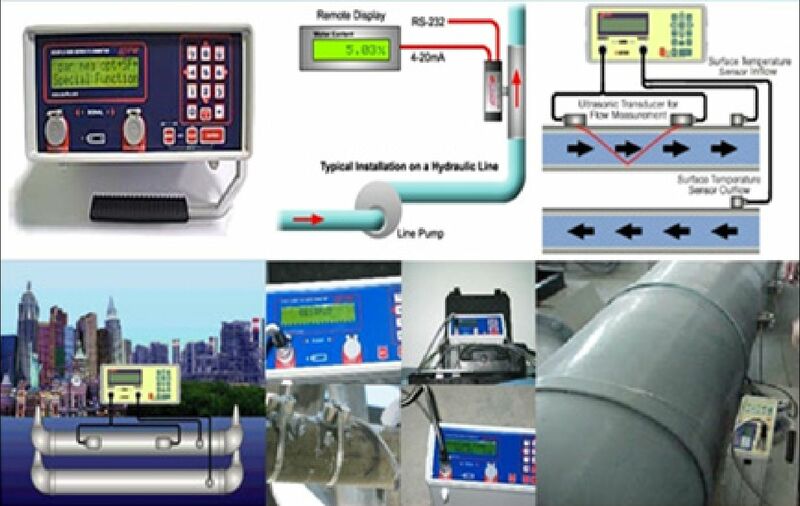 The portable device has been designed to meet the needs of the service/maintenance and commissioning engineer wishing to check the flow rate of liquids at different locations in the plant. The set-up of the unit is simple and user friendly in order to obtain the required flow information. Measurements of flow are made by penetrating the pipe with ultrasonic sound wave, subsequently time differences, frequency variations and phase shifts where it evaluate and produce accurate flow information. The ultrasonic sensors are clamped onto the outside of the pipe work to measure the flow process. 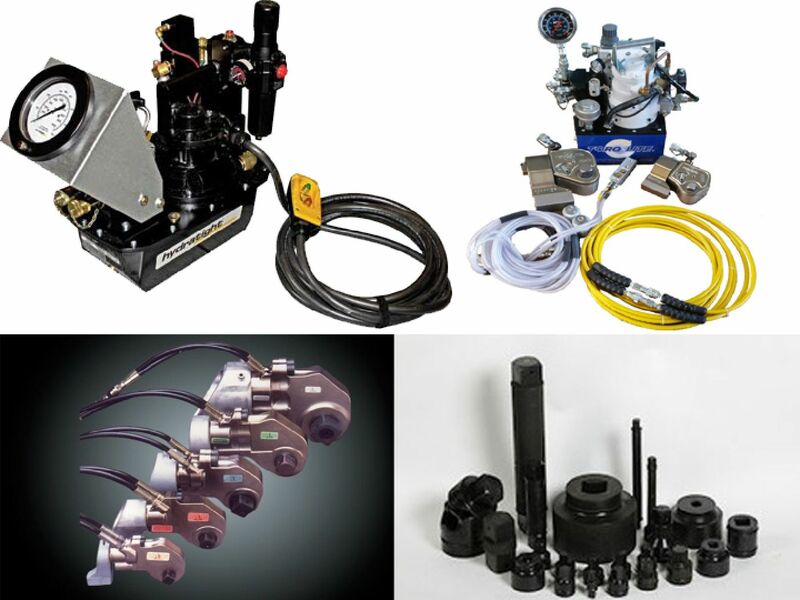 The unit can be applied to any type of standard pipe carrying either clean or dirty liquids. 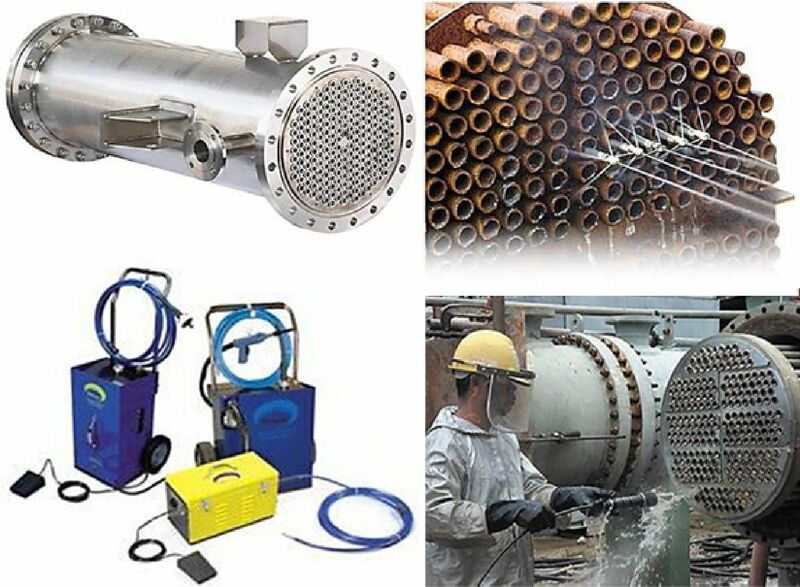 Tube Cleaning Systems are designed for cleaning straight tubes in tube boilers, air heaters, condensers and other pressure vessels with a 1-1/2 to 4-1/2-inch Outer Diameter. They are ideal for removing soot and scale. Each kit includes an electric drive unit and all accessories and tools required for thorough tube cleaning. High rotating speed @ 1,725rpm, the expanding heavy duty brush shaft clean casing tube in an ease. 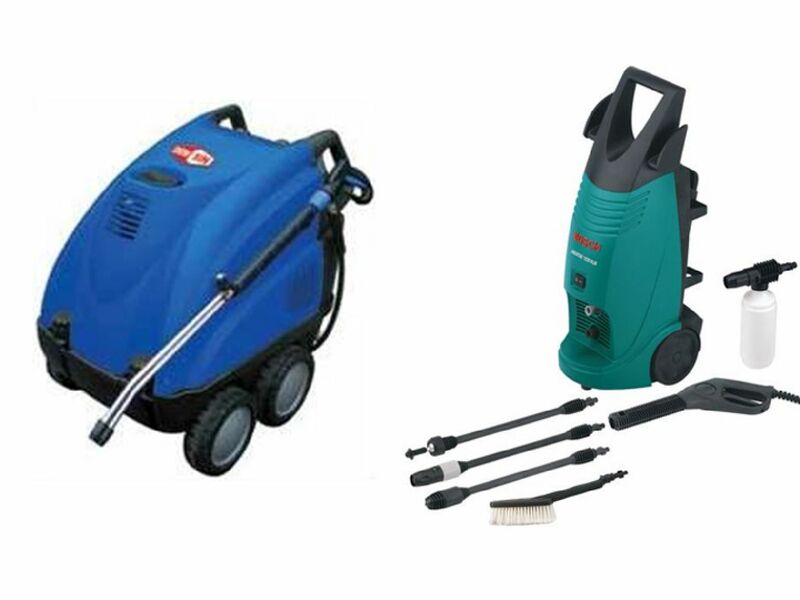 High Pressure Cleaner (Hot Water) is ideal cleaning equipment for de-greasing applications in multiple industries. 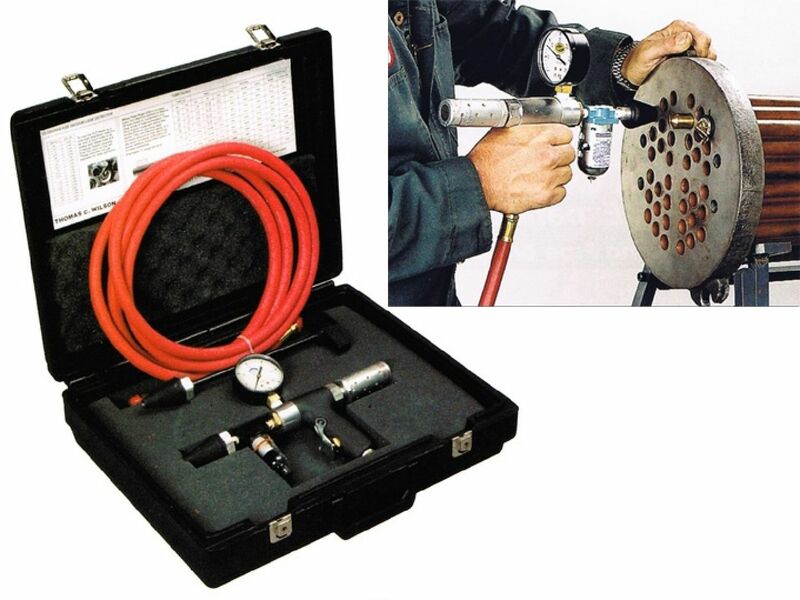 The Vacuum Leak Detector (VLD) is a simple test instrument used for condensers, heat exchangers and other tubular apparatus to identify tubes leakage. Sealing the far end of each tube with a snap type tube plug then presses the rubber coated nozzle into the near end of the tube and depresses the trigger. Compressed air flows through a venturi chamber to produce a vacuum in the tested tube. When this vacuum reaches a satisfactory level, he releases the trigger. A steady Gauge reading indicates a good tube. A falling vacuum indicates tube leakage. Using a 90psi dry clean air, a typical tube (1inch OD x 20 Gauge & 20ft long) can be tested in 6 to 8 seconds. The tool weighs 2 1/4lbs. and is equipped with a muffler, so it operates quietly even in confined areas.